Trout is one of the healthiest fish you can include in your diet, says Monterrey Bay Aquarium’s Seafood Watch. Some would conclude that farmed raise fish is better for you as it is raised in fresh water protected from environmental hazards (EH). The protection from EH is great, but is farmed fish over wild fish better for you? Is farmed fish equal to wild caught fish? Trout born in the wild eat just about anything, like young zoo plankton, fish eggs, small fish, crustaceans, mollusks, insects and even mice. In dense habitats with aquatic vegetation, rainbow trout often have the opportunity to eat arthropods that fall into the stream (National Wildlife Federation). Farmed trout is fed a formulated fish feed, and each feed company has their own recipe. Feeds are made with fish meal, and fish oil combined with other ingredients like wheat, soybean meal, and poultry by-product meal. Notice the difference in the diet? Are fish meant to eat chicken, soy or wheat? A wild trouts diet shows otherwise. Fish species evaluated by the USDA, found that farm-raised fish contained more total fat than their wild counterparts. 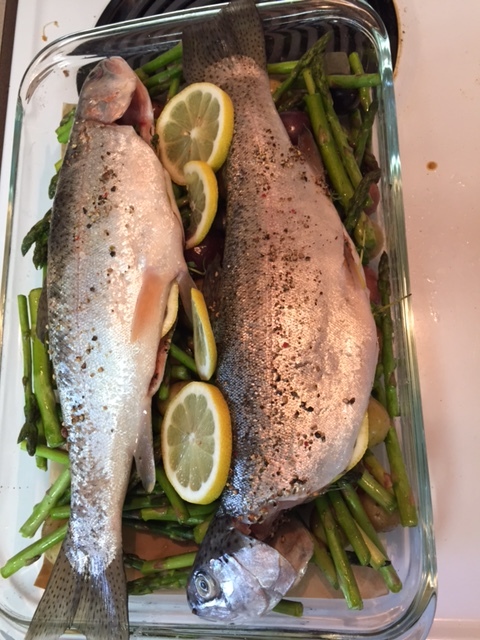 Rainbow trout showed little difference in fat. Some could conclude that has to be good, the more fat the more omega-3 fatty acids the fish contains. Not necessarily. The extra fat in farmed-fish is inflammation causing omega-6 (Nutritional Health and Fitness). 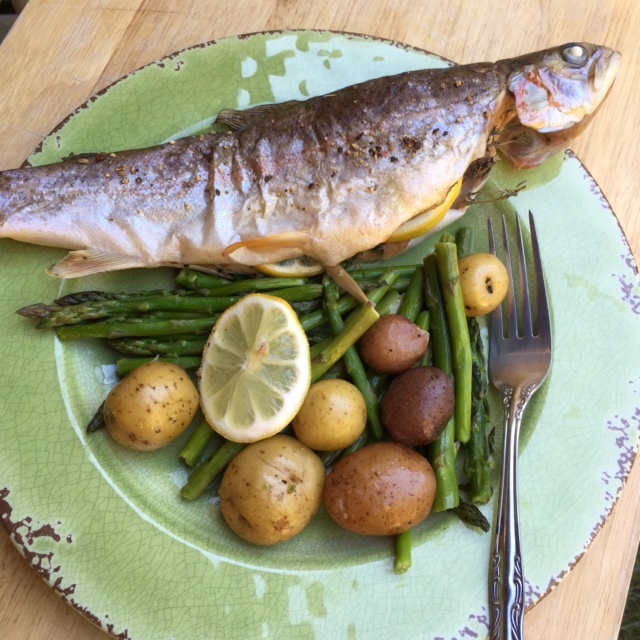 Enough of the fishy information, now for our featured recipe: Roasted Trout with Baby Potatoes and Asparagus. 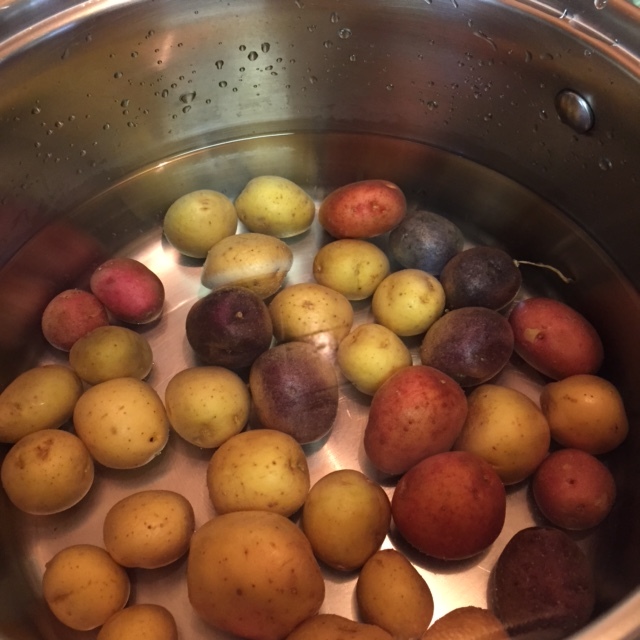 Place potatoes in a large saucepan and fill with water to cover potatoes within 1-inch. Bring to a boil and cook until barely tender, about 10 minutes. Drain and set aside. 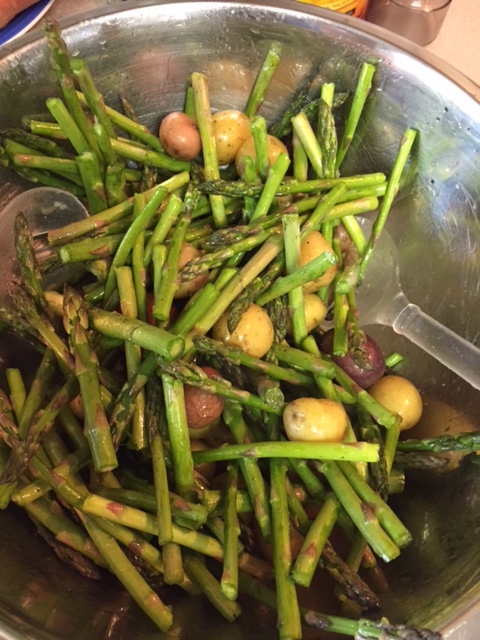 In a large bowl add salt, pepper, olive oil, trimmed asparagus and cooked potatoes. Mix vegetables to coat with oil. 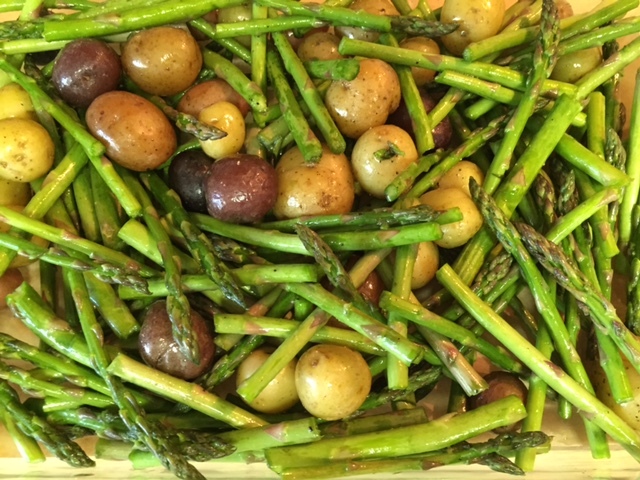 Arrange vegetables in a 9 X 13 inch glass baking pan, and set aside. Rub the fish inside and out with the crushed pepper corns. Next stuff the fish with a fresh sprig or two of thyme and a lemon slice cut in two. 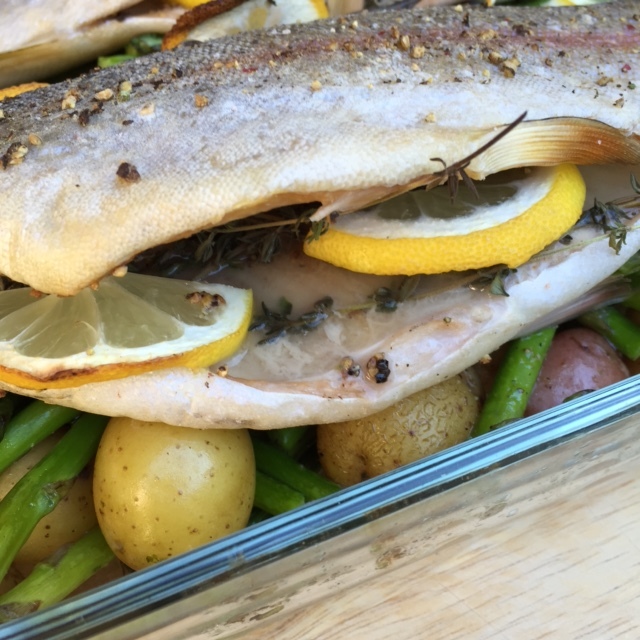 Arrange fish over vegetables in glass baking pan, and add 3 or 4 lemon slices. Place into heated oven and cooked 25 minutes or until the potatoes are crisp and tender and the fish is cooked through. Remove fish and let cool about 5 minutes. This entry was posted in Fish, Main Dish and tagged Aquaculture, Aquaculture of salmon, Beef, Cargill, China, Dog food, EWOS, Fish, Fish farming, Wild fisheries. Bookmark the permalink. Lovely meal with lots of health benefits.